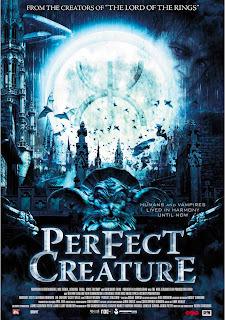 From New Zealand, we get Perfect Creature, an alternative history, steam-punk, vampires as holy order movie. And it actually works and is pretty damn cool. The story centers around Edgar, a rogue vampire who's decided that killing people is okay. The vampire holy order dispatches Silius to quietly stop him. They're trying to keep the transgressions hush hush because they don't want humans to stop giving them yummy blood and go all Van Helsing on their asses. They're able to keep it quiet because there's a flu epidemic. People are dieing anyway. A few more bodies isn't that strange. Eventually though, the human police are told, but instead of being all outraged and self righteous about the vamps covering up the deaths, they're fully on board with keeping it quiet to prevent widespread pandemonium, which is so damn awesome for being so reasonable. Silius is paired up with police captain Lilly for the vamphunt. I liked her character and the actress Saffron Burrows. She's understated, taciturn, competent, and has a quiet stoicism about her. It was also nice just to see a woman in a strong role without the inherent brashness writers feel the need to bestow on these sorts. Edgar and Silius do end up fighting over her, but Lilly proves more than capable of taking care of herself. The film is rather slow at times and preachy. Genetic experimentation is the hot button topic. I'll sum it up for you: It's bad, we shouldn't do, or we'll all die. The whole genetic experimentation thing is the weakest part of the film because it's based on bad science. They claim vampires are a new species, but they're born randomly within the human population, and have not managed reproducing on their own. That means they can't be called a new species, even I know that. But Edgar's whole diabolical plan rests on this bad science. I think the main problems are in the fact that they try to make the vampires the holders of scientific discovery and religious figures at the same time. The two ideas don't really mix. But the world itself is fascinating, from the steam powered cars to the Zeppelins in the sky. It's neat just to follow people down the street. And the characters are sympathetic. Dougray Scott, who plays Silius, is easy to root for. He's contemplative, humble, and strong. Lilly's team of cops are not introduced well and are left on the periphery, except for Detective Jones who is the "romantic" rival of Silius for Lilly. I put romance in quotes because there isn't any hearts and flowers or steamy interludes. Jones clearly has a major crush on Lilly, but she never acknowledges it, and she never shows any fancy for Silius. Silius is interested in her, but he's a priest so he's chaste. No hanky-panky going on with anyone. This movie really surprised me. The DVD cover Netflix displays does not illustrate the movie at all. It's a red face with fangs. The one above is better, but there are no bats in this movie whatsoever. Don't let the cover art fool you. It's a good movie. hmmm.... I like new zealand flicks. wonder when this one will come to our shores? Thanks for the pointer, just caught it tonight. Not bad overall, and its vampire mythology is certainly unique (you're born with it, no viruses or demon spirits transmitted with a tainted bite). This movie certainly was a different take on vampire myth, which I am all for. I get tired of seeing the same-old same-old over and again. It was a little slow, but I liked Saffron, and some of the scenes were well worth waiting for. This is one of those things hubby and I caught on premium channels late at night, and were glad for it. Now I just wish I could think of the cool Asian vampire flick we caught. We thought it would be a bomb, but we keep hoping we can catch it again. I work at Library X, an undergraduate library at University Z. Library X is open 24hrs a day, 5 days a week. Once upon a time, I worked the 4pm-1am shift and before that I worked 12am-8am. Now I work days, but the moniker remains. All characters in this blog are fictional, and any resemblance to persons living or dead (HA!) is purely coincidental.